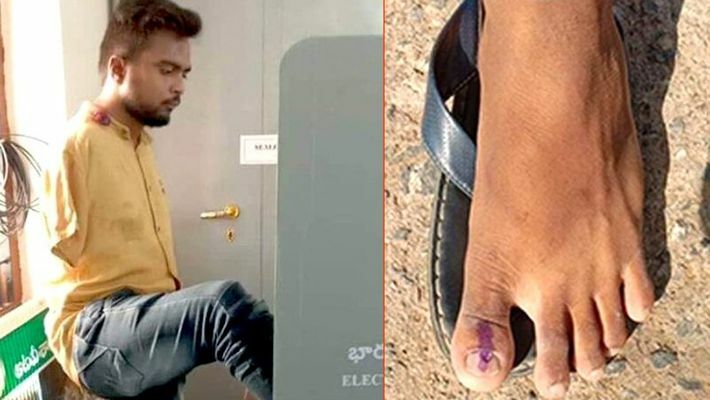 Hyderabad: A 25-year-old man has stormed the internet after his picture of voting went viral. Zakir Pasha, a man with no hands, turned up to vote in Adilabad constituency, Telangana. Pasha, a resident of Kagaznagar in Asifabad district went to cast his vote. And within hours of him voting he became an inspiration to many. On April 11, he went to cast his vote using his foot. The staff of the booth was stunned as Pasha went about the formalities without seeking help. Pasha pressed the EVM button with his toe and then lifted his leg on the table for the staff to ink his toe and signed the paper by holding the pen in his right foot. 2019 Lok Sabha elections are being held in seven phases, phase one on April 11, phase two on April 18, phase three on April 23, phase four on April 29, phase 5 on May 6, phase 6 on May 12 and phase 7 on May 19. The date of counting is May 23. Telangana’s 17 constituencies witnessed polling on April 11. The neighbouring state Andhra Pradesh saw Assembly and Lok Sabha elections conducted on the same date.